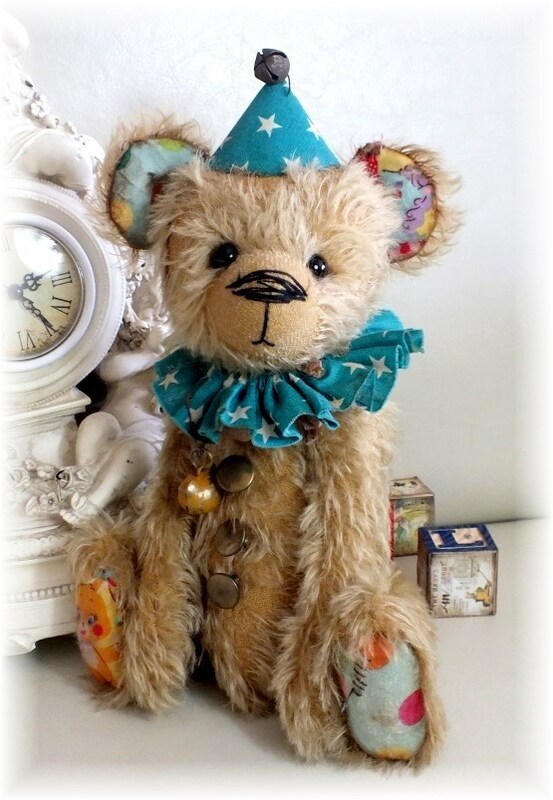 Shabby is a lovely teddy bear dressed as a clown (teal green ruffle and hat), in a caramel brown mohair, with glass eyes and various time worn accessories. He is weighted and fully jointed, and measures approx. 30cm/12 inches in height. Since his retirement from the trade, Mr Sunbeam has really embraced his new life. He's very photogenic and you can tilt his head, really special. 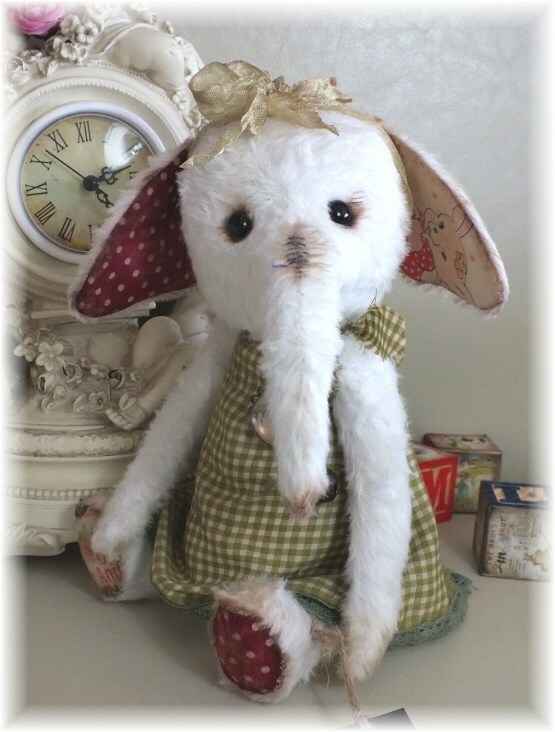 He's created in black mohair with creamy plush accents. 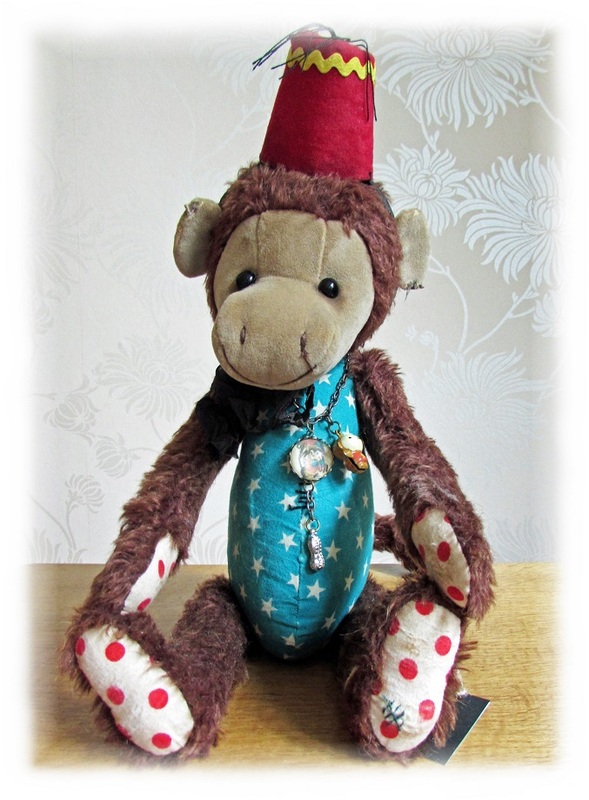 He wears an olde-worlde swim-suit in blue and cream striped fabric and he's got his spotty handkerchief hat on too! 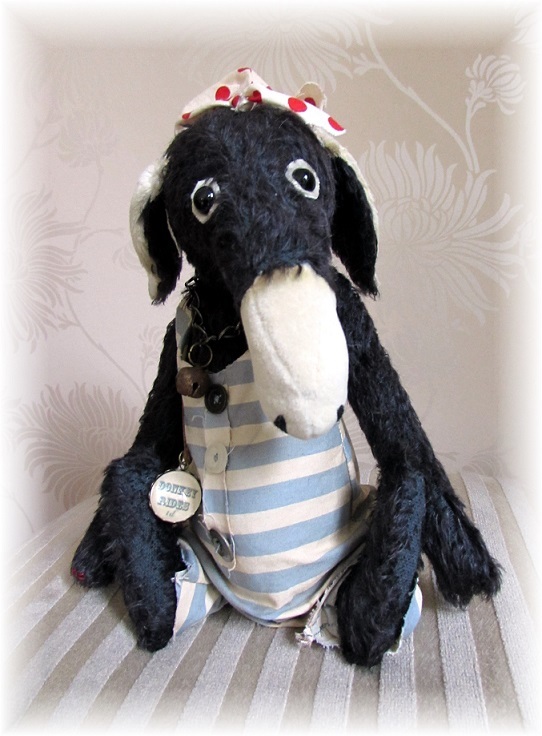 Mr Sunbeam has a twinkle in his black glass eyes and sports various time worn accessories. He is weighted and fully jointed, and measures approx. 25cm/10 inches in height. 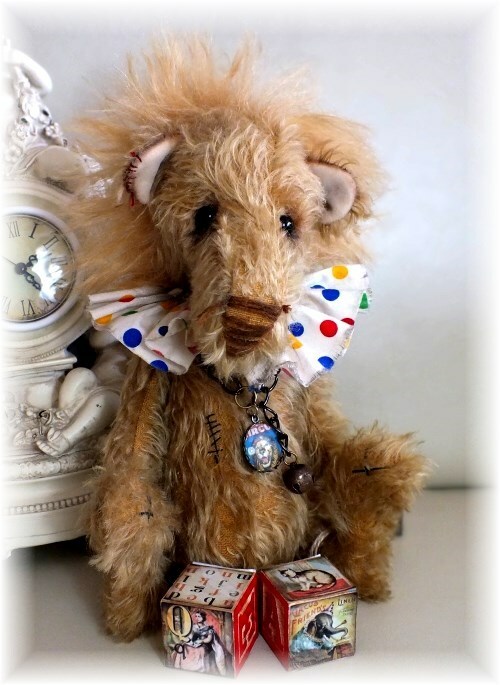 Lenin the Circus lion, has an amazing mane of hair! 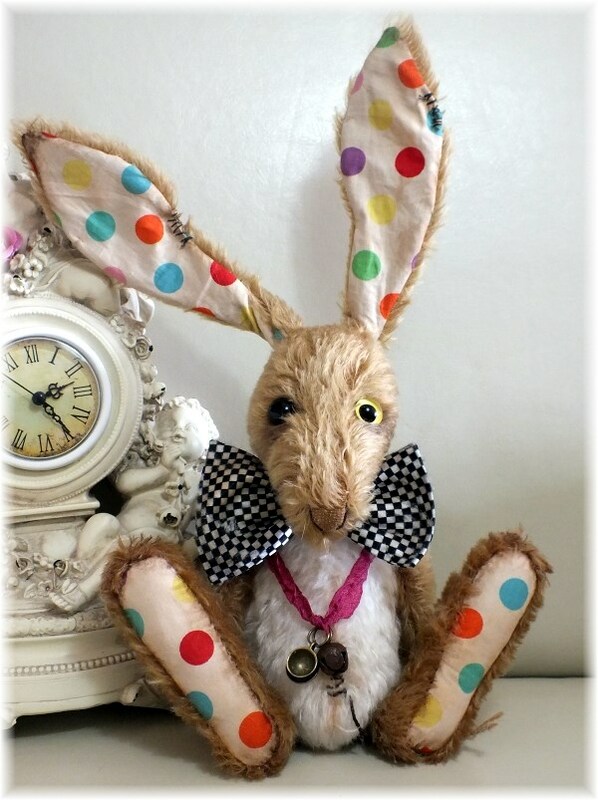 In a rich caramel mohair with a polka dot ruffle, he has glass eyes and various time worn accessories. He is weighted and fully jointed, and measures approx. 25cm/10 inches in height. 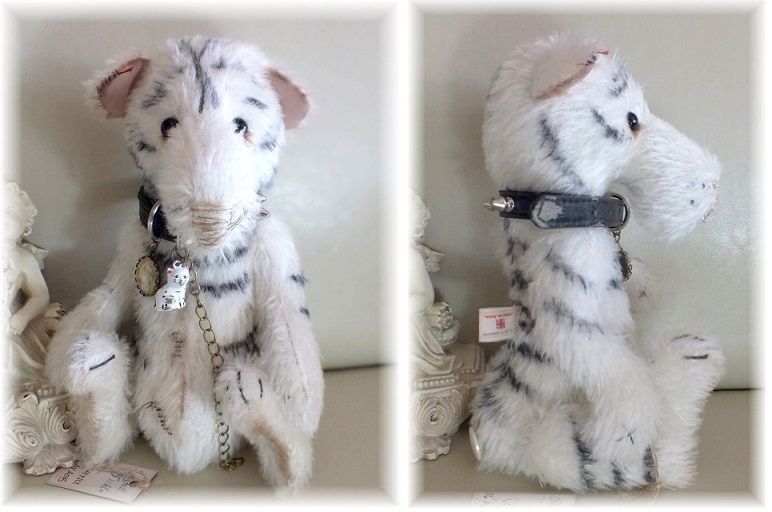 Vishnu is a beautiful and rare white tiger. 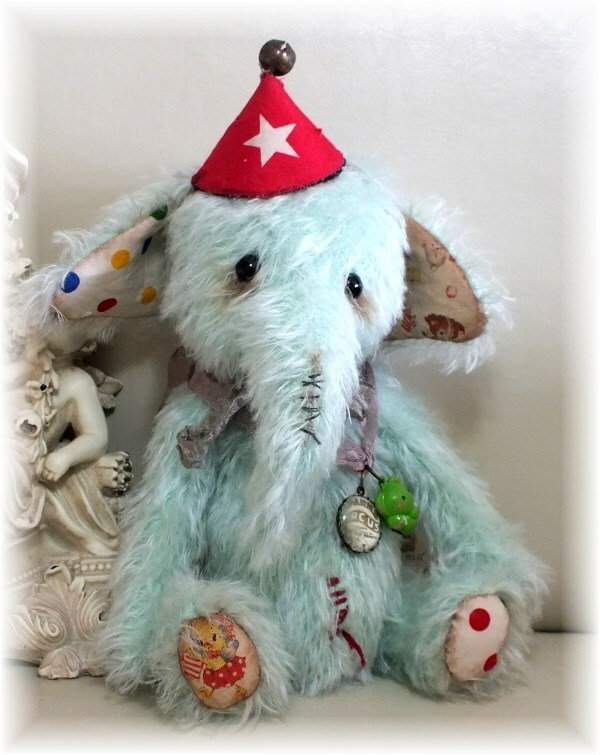 Retired from the Circus in need of a new loving home. He's exceptionally tame with no teeth or claws! 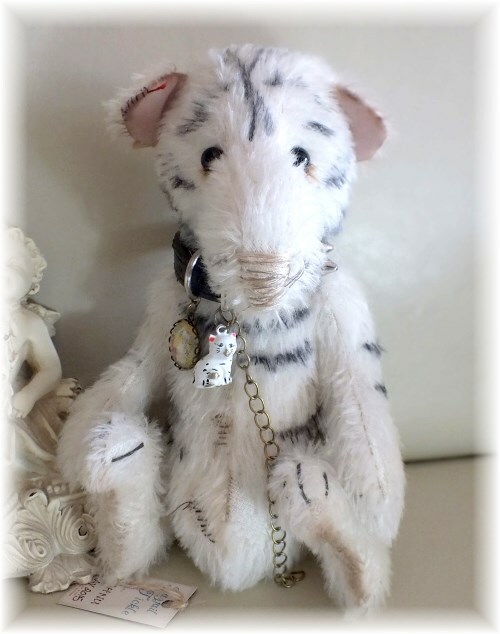 He is made from an off-white mohairwith hand-applied tiger stripes. He wears a handsome studded collar, he has glass eyes and various time worn accessories. He is weighted and fully jointed, and measures approx. 25cm/10 inches in height. Purrdy is just the cutest cat! 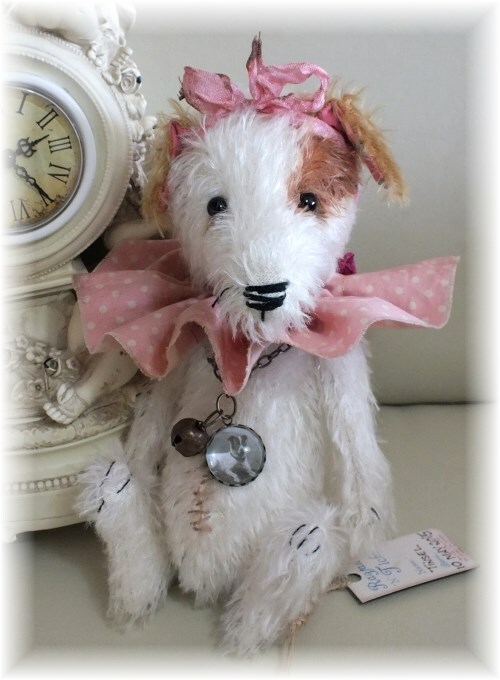 In an off-white mohair with pastel pink collar and pink fabric accents. 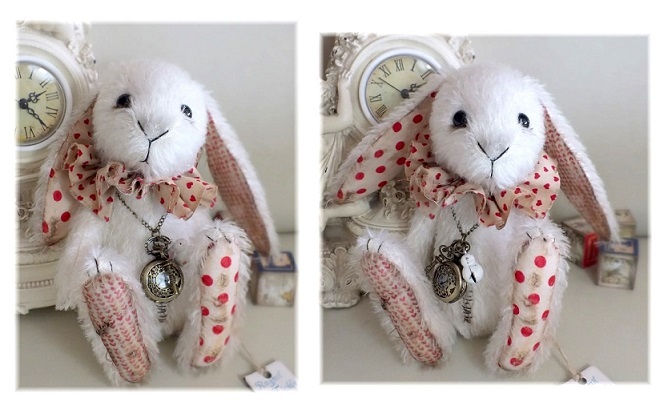 She has glass eyes and various time worn accessories. She is weighted and fully jointed, and measures approx. 25cm/10 inches in height. 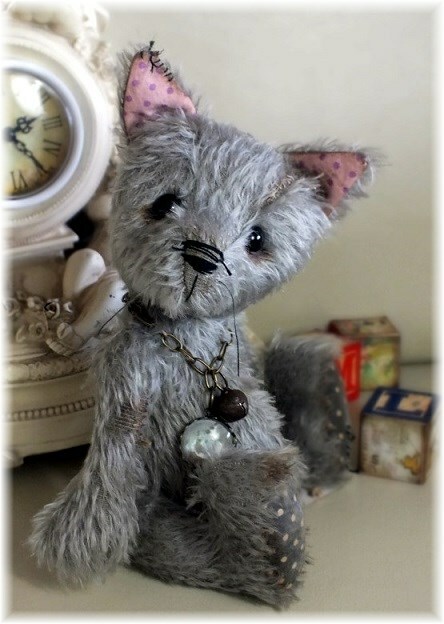 Chimney is just the cutest little kitty cat! 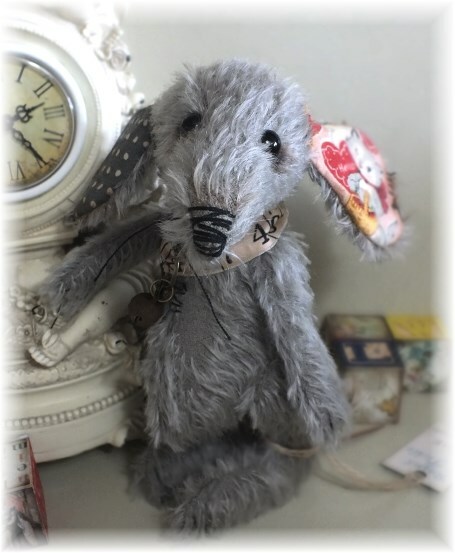 In a mid-grey mohair with grey/pink fabric accents.Such an appealing face, he is fully house trained and looking for a loving owner. He has glass eyes and various time worn accessories. He is weighted and fully jointed, and measures approx. 25cm/10 inches in height. Scruffy is just the sweetest kitty cat! Fully house trained and so soft. 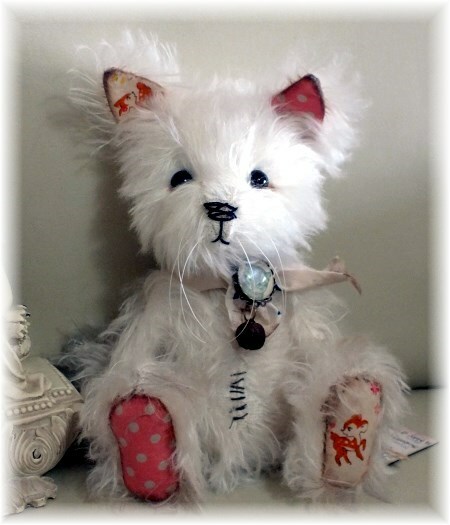 In an off-white long-hair mohair with pastel pink fabric accents. 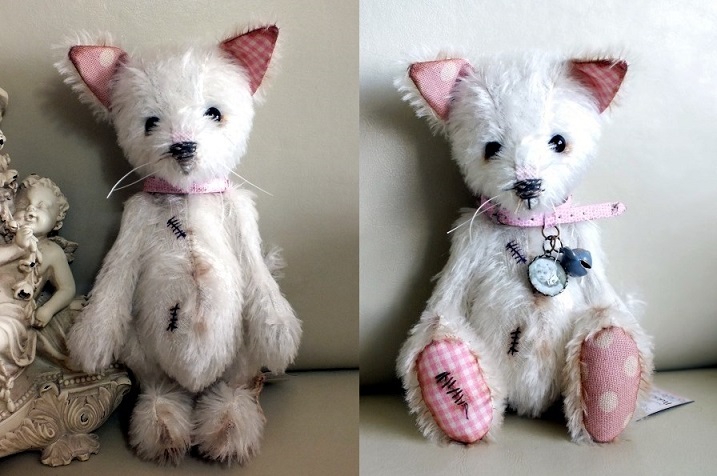 She has glass eyes and various time worn accessories. She is weighted and fully jointed, and measures approx. 25cm/10 inches in height. 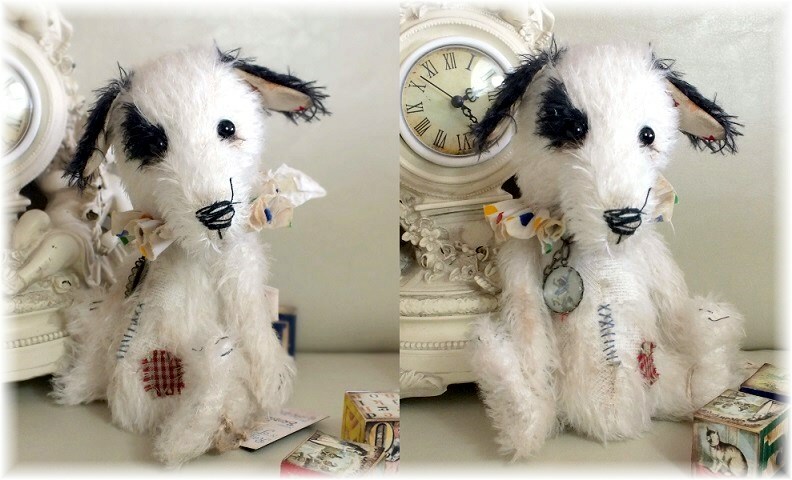 Vintaged White & Black Jack Russell Dog, his name is Brodie and he is a rather sad looking little chap, but he's so cute! He is 20cm/8 inches tall. 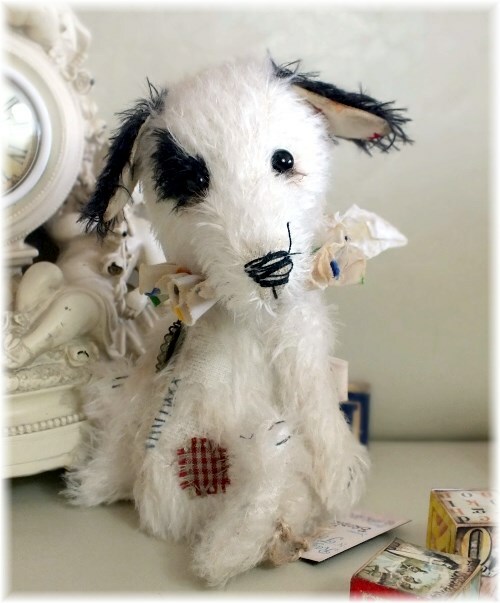 Fully jointed, in mohair and weighted. 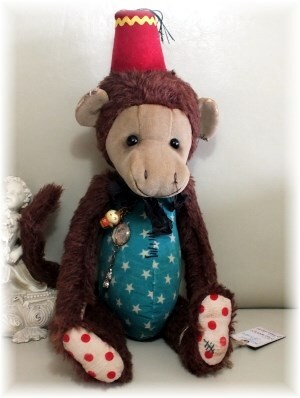 He has glass eyes and various time-worn accessories such as a polka-dot fabric ruffle and a dog-chain with bell and a photo pendant of his time in the Circus trade. His life-so-far, he's a rescued Circus dog in need of a new loving forever home! He comes with a COA/Adoption Certificate & Pump Bag. 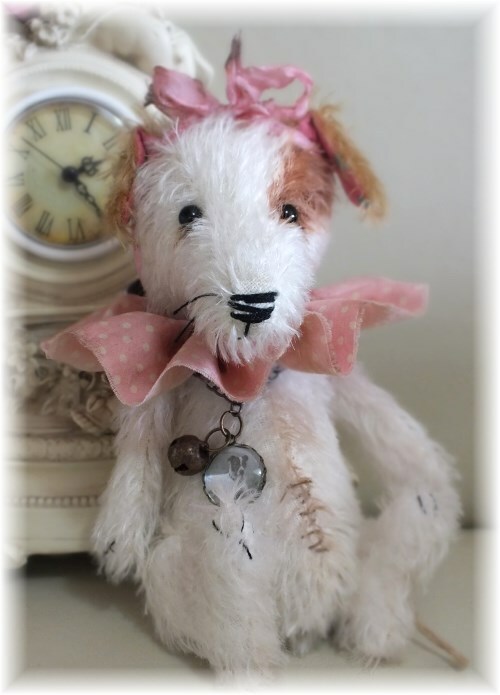 The item has been 'vintaged' to give it an old authentic antique feel. Cassidy is a very foxy looking chap, he's had a hard life of constant victimisation from farmers. He can't understand it as he loves chickens, sheep and rabbits! 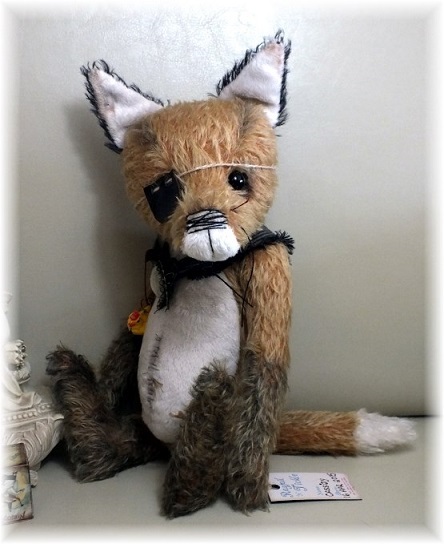 In a two-tone caramel and brown mohair with paler creamy accents, he has a bushy fox tail and he wears a very chic neck scarf and various time worn accessories, including a chicken bell and a brooch with his favourite sheep picture. 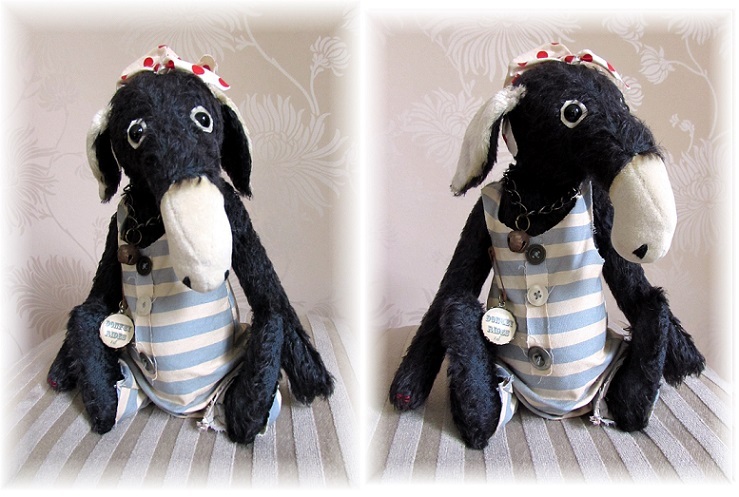 He has two black glass eyes, one is covered with an eye-patch (removable). He is weighted and fully jointed, and measures approx. 25cm/10 inches in height. Jennifer is a true beauty, and very girly! She's a little shy but has bags of vintage style. 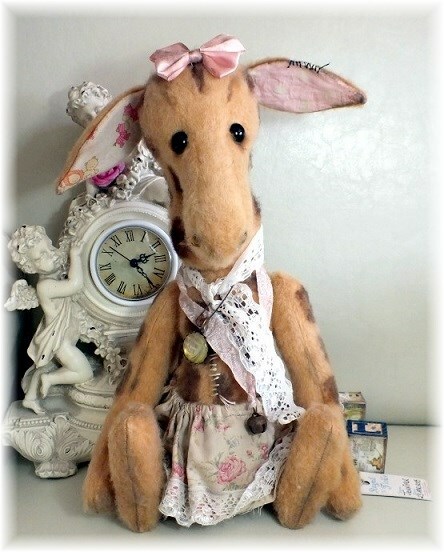 In a pale caramel coloured soft felted mohair with glass eyes, she wears a delightful apron style skirt with dusty pink roses and various time worn accessories with a hint at her past, ex-Circus perhaps? She is weighted and fully jointed, and measures approx. 36cm/14 inches in height. 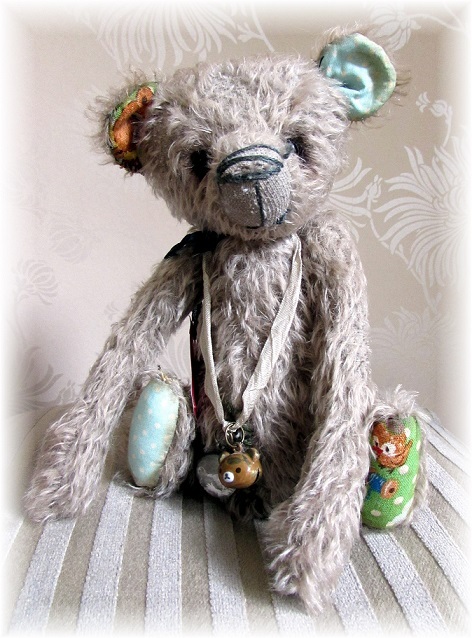 Chutney is a very handsome teddy bear, in a pale taupe mohair, with black glass eyes. 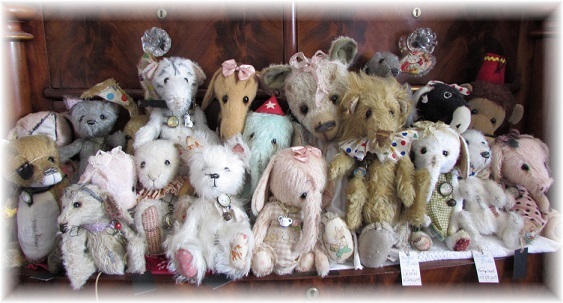 No frills here just all teddy with bags of personality. 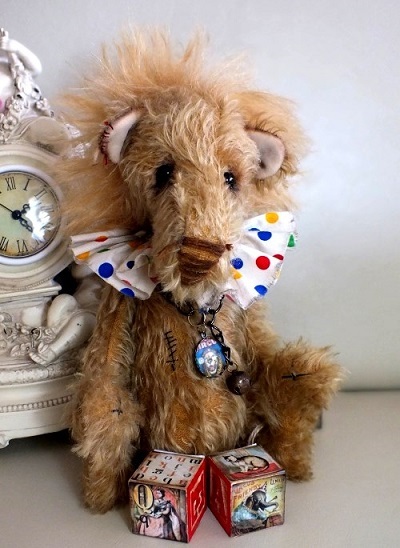 He has been purposefully time-worn to look antique. 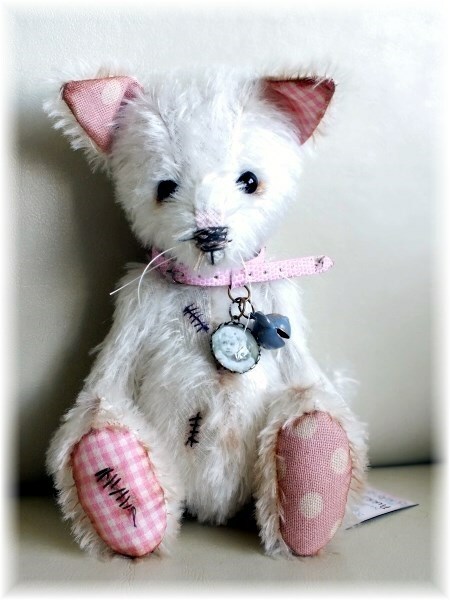 He's fully jointed with a hump on his back, faded fabric feet pads and ear centres. 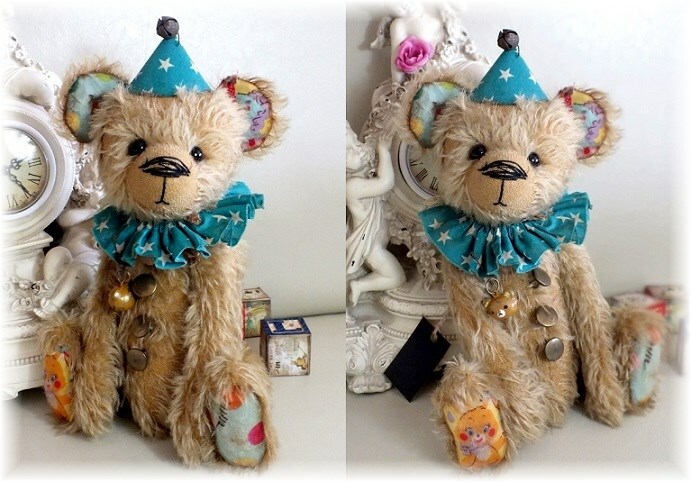 Really cute bear-necessities: a bear bell and a small cabochon holding an old photo of himself with a little child. Laid out flat Chutney measures 9 inches/23 cm. 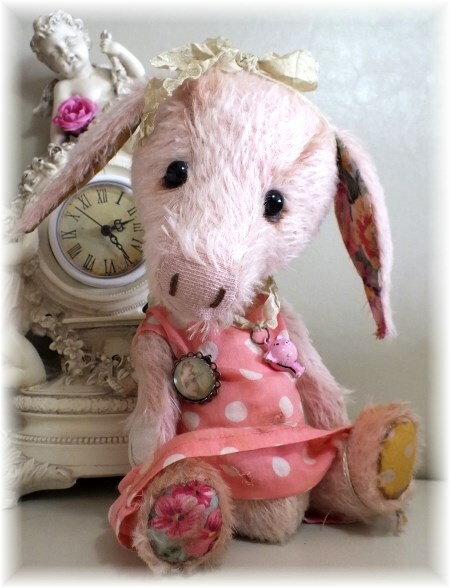 Cutie Cherry Pie is just an adorably sweet character, made from vintage pink mohair and accented with mis-matched polka-dot and bunny rabbit fabrics. 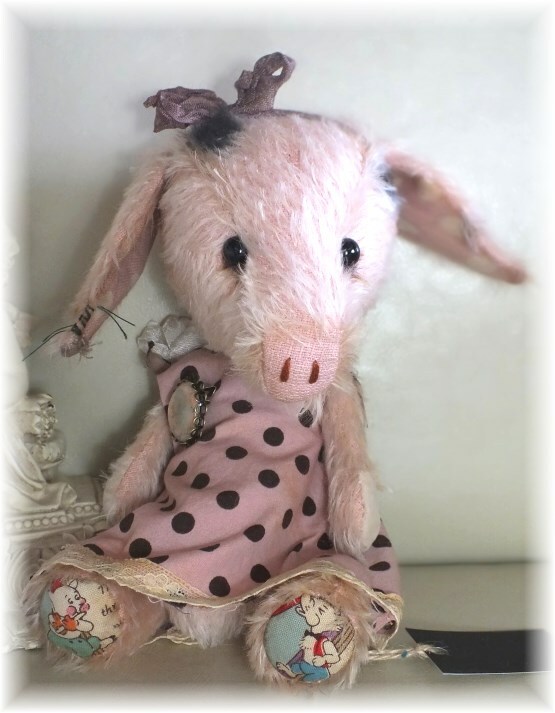 She has a pretty pink bow, faded gingham check dress and various time-worn accessories. She has black glass eyes, she is weighted and fully jointed. She measures approx. 9 inches/23cm. 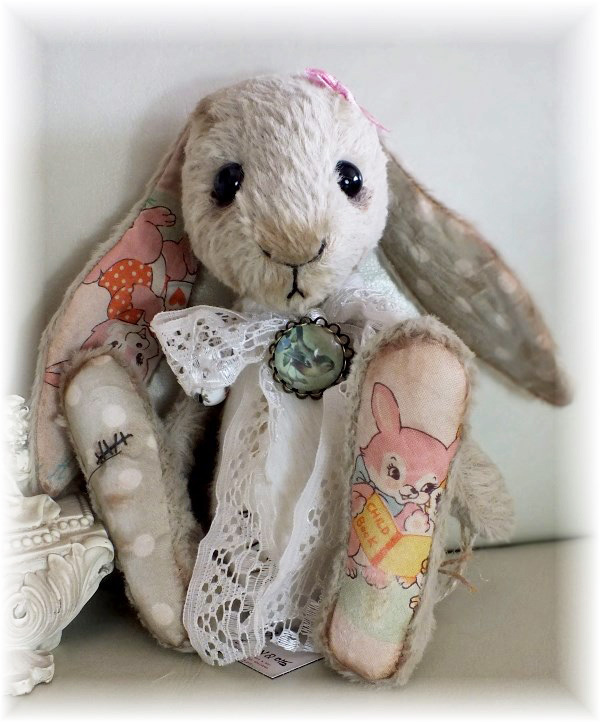 We love Sorrel the little shy bunny rabbit, she's got such a sweet face. 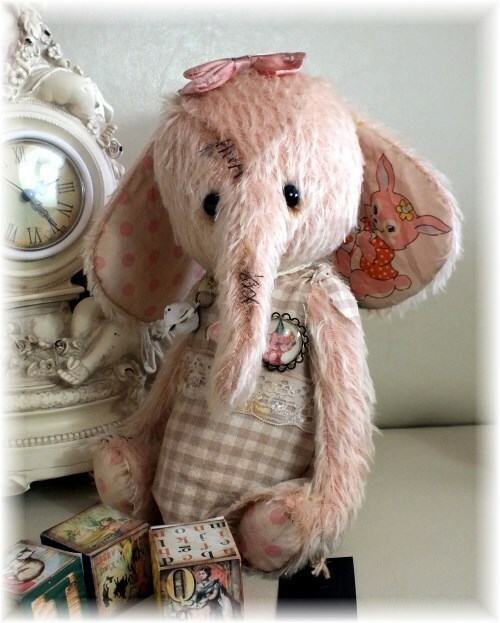 She's a little shy but has so much character and oozes vintage style. 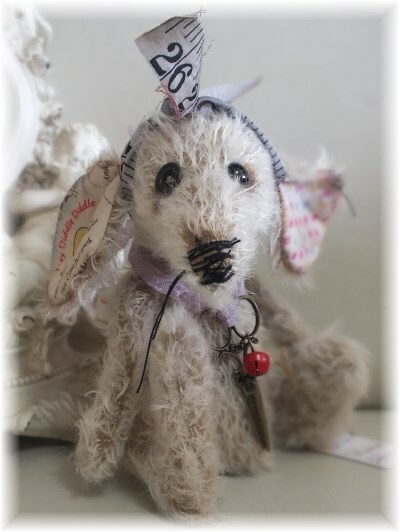 In a pale beige coloured very soft fine mohair and black glass eyes. 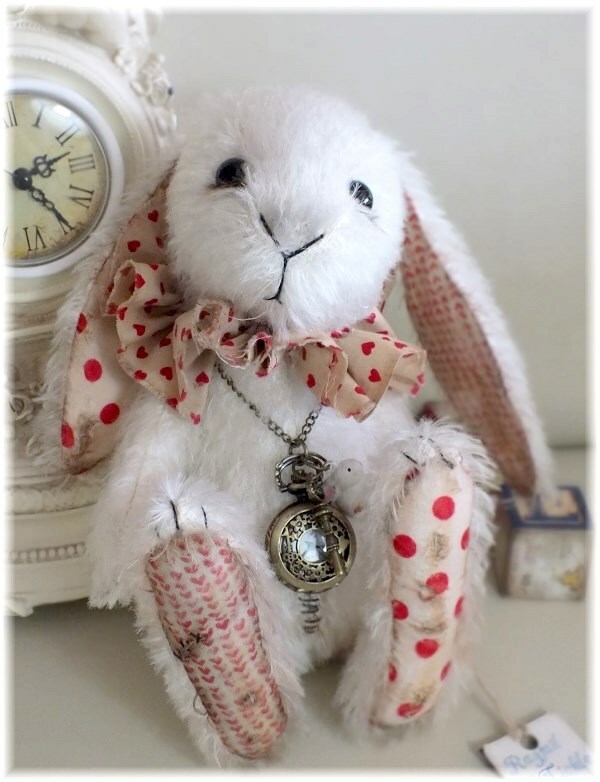 She wears various time worn accessories, including a sweet little rabbit bell and bird brooch. She is weighted and fully jointed, and measures approx. 21 cm/8.5 inches in a stood-up position.